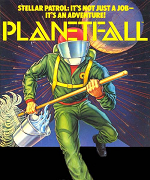 Planetfall is a science fiction interactive fiction computer game written by Steve Meretzky and published by Infocom in 1983. It was Meretzky's first game to be written for Infocom and it proved to be one of his most popular works and a best-seller for the company. The game starts with the user assuming the role of a lowly Ensign Seventh Class on the S.P.S. Feinstein, a starship of the Stellar Patrol. Overbearing superior Ensign First Class Blather assigns the player to mop decks, not exactly the glorious adventures promised by the recruiters on Gallium. But a sudden series of explosions aboard the ship sends the player scrambling for an escape pod, which eventually crash-lands on a nearby planet. In many earlier games, the battery power of the lantern had been limiting factor, Planetfall replaced this element with the somewhat more realistic requirement that the player sleep and eat regularly. The concept of a NPC sidekick (Floyd) was also new for Infocom games. Floyd would follow the player from location to location and interaction with him was required in order to complete the game. The sample transcript included in the Planetfall packaging was later turned into its own game: Spacestation (David Ledgard; 1998; Z-code). It was entered in IF Comp 1998 where it took 19th place. Planetfall (Steve Meretzky, publisher: Infocom; 1983; Z-code). Planetfall (Steve Meretzky, publisher: Infocom; 1983-85; Z-code). Planetfall is available on the Classic Text Adventure Masterpieces of Infocom CD. Planetfall - at SPAG, reviewed by Graeme Cree and Alex Freeman. Review - by J. Robinson Wheeler. This page was last modified on 20 October 2014, at 04:31.